Hey hey! Have you heard? 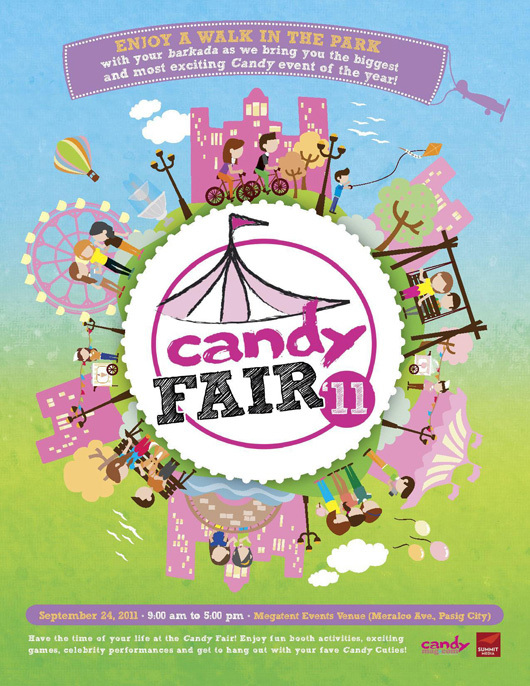 Candy Magazine’s fair is happening today at the Megatent Events Venue along Meralco Ave. from 9am to 5pm. It’s another fun-filled day of laughter and games. Visit all 12 booths and join in the many activities and exciting games each of them has prepared. I’ll actually be in one of the booths from 11am til 4pm. Which booth you ask? None other than, Candie’s (the same clothing brand I walked the runway for here)! Because I love Candy and Candie’s, I’ll be participating in a few activities prepared by Candie’s (that’s a lot of “candy” in 1 sentence), one of which involves a chance to win a date with a certified Candy cutie! I’ll personally select the lucky contestants. I’ll even do a little hosting! So what are you waiting for? Meet me at the park later, along with Candy cuties Sam Conception and Elmo Magalona. Just bring Candy Magazine’s September issue with you to get in. I’ve actually already seen the concept and design for this year’s Candy fair a few weeks back. And I must say, I can’t wait to see Megatent transform into the most beautiful park in the Metro, at least for the day!